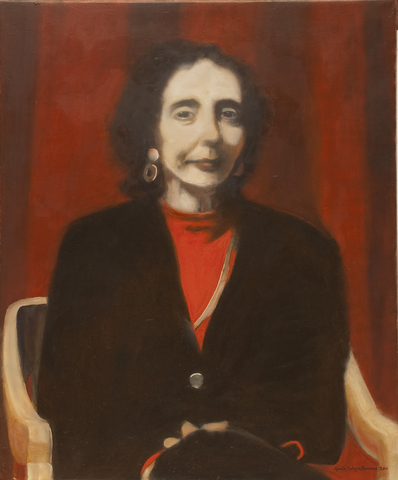 This image is a portrait of Joyce Carol Oates painted by Gavin Cologne-Brookes. The image was published in the book 'Joyce Carol Oates' along with the essay also by Gavin Cologne-Brookes entitled 'Joyce Carol Oates: something like this'. Translated into French for publication in the Cahiers de L'Herne series for Éditions de L'Herne, the focus of the essay is this painting, which the subject responded to by saying "I hope I am something like this, in fact". Oil on canvas, originally exhibited in 2011. Published in 'Joyce Carol Oates' edited by T. Tromble and C. Marquette for Cahiers de L'Herne, Paris in 2017. ISBN 9782851971890.